I just had to do another card with this sketch! This one uses PaperTrey's Baby Button Bits and Basic Grey Urban Prairie paper. The ribbon is PaperTrey's Aqua Mist satin ribbon. Loving this!! Hope to play later...off to teach a marriage group. This is just absoloutely fantastic!!! Love it! Clean & simple indeed - having the bee by itself in the crisp white really makes it stand out. Love all of the cards you made with this sketch. You've inspired me to create! 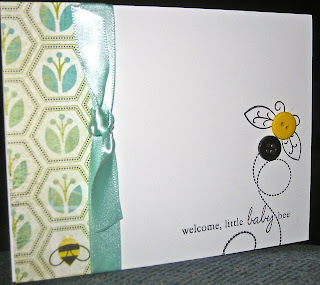 So cute, love the 'bee' with the buttons, love this card! This is so cute with the button bee image that coordinates with your patterned paper. Love the use of the buttons!